Insulated/Padded bag that fits on the back of a wheelchair. This bag with its adjustable straps could fit additional equipment such as a walker, scooter, and auto seat back. 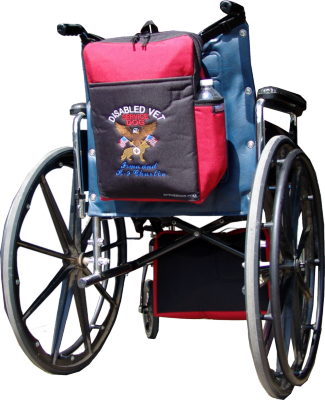 The straps that loop over the wheelchair back handles are adjustable so this bag can accommodate different widths of wheel chairs. And the straps have side release buckles for easy on and off. The bag has a large front pocket with key ring inside the pocket for safe keeping. The zipper has double zipper slides and extends all the way down on one side of the bag making getting in the bag while sitting in the chair much easier. There is a water bottle holder on the other side of this bag. Back handle and finger tab for carrying the bag. The front pocket panel comes with a variety of embroidery choices that are beautifully done in high stitch count embroidery work. This bag comes in two colors they are, solid black or red/ black combination. Size is: 15” tall x 12” wide x 4” deep.